Lindsay Lohan is rolling the dice and hoping that a jury will believe her claim that she is not a thief. According to Los Angeles prosecutors, the actress turned down a plea deal that included jail time and opted instead to move toward a trial in her felony grand theft case. Lohan is accused of stealing a $2,500 necklace from a Venice, California store. Lohan maintains that she believed the necklace was loaned to her but the store’s owners say otherwise. A preliminary hearing to determine if there is enough evidence for a trail is set to begin on April 22. If convicted, Lohan faces a maximum of three years in prison. Simon Cowell’s company will do anything to generate any kind of publicity for X Factor – including leaking names of potential judges. Earlier this week Nicki Minaj’s name was thrown into the mix along with Jessica Simpson and Paula Abdul but sources connected to the rapper say she will not be taking the gig on the show. Boardwalk Empire star Paz de la Huerta was arrested Wednesday night after she allegedly threw a glass at Samantha Swetra at a party and then punched her in the face. Apparently Samantha got defensive when Paz started hitting on her male friend and made a few mean remarks about Paz’s level of inebriation. Paz took offense and immediately got physical with Samantha. NeNe Leakes is not done trash talking Star Jones. Appearing on The Ellen DeGeneres Show, Leakes told DeGeneres that she and Jones were never friendly. She referred to her Celebrity Apprentice nemesis as bossy, manipulative and conniving. 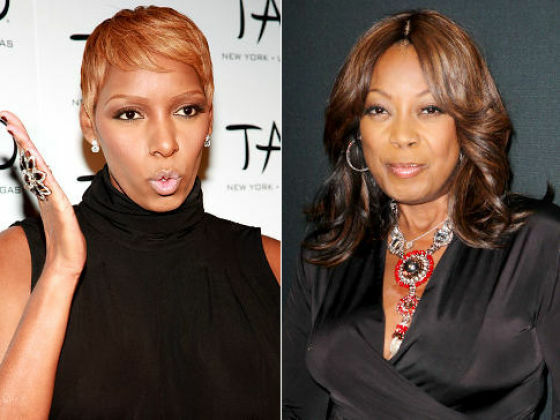 Leakes has been on a one-woman campaign to bad mouth Jones since the two starred on Celebrity Apprentice but Jones has refused to be dragged into the nasty public catfight. Brooklyn Decker is ready for spring and she’s doing it the same way her Just Go With It costar, Jennifer Aniston, did it – by chopping off her hair. The blonde model- turned- actress cut 10 inches off her famous locks and proudly debuted the new look on Twitter. They gave it a second try but it just wasn’t meant to be for Rachel Bilson and Hayden Christensen. The couple has decided to split – again. They met in 2007 on the set of Jumper, got engaged in December 2008 but called it off in August 2010 before reuniting. A source claims Bilson has really had it and that the engagement is over and so is the relationship. Her 35th birthday celebration may have been a low-key affair but come this weekend, Reese Witherspoon will be surrounded by at least 100 of her closest friends and family as she exchanges vows with her fiancé, CAA agent Jim Toth at her home in Ojai, California. Preparations are already underway with a white marquee already erected on the grounds. This will be a second marriage for Witherspoon who was previously hitched to Ryan Phillippe and a first for Toth who popped the question with a 4-carat Ashoka diamond.